Kenzie is riding in style and comfort in grandma's car with the Graco Head Wise 70 Car Seat so Mason will be enjoying his gift of safety in the same car with the Graco Smart Seat™ All-in-One Car Seat with Safety Surround™ Protection. This is a super cool seat and I can't wait to surprise him on Christmas at grammy's house. Graco is one of the world's best known and most trusted juvenile products companies. When I was pregnant with Kenzie, Graco was one of the brands that my mother told me that she used when my brother and I were little. Needless to say that we purchased many Graco products for her and now fast forward, we are still using and purchasing Graco products for Mason. The Graco® Smart Seat™ All-in-One car seat is the ultimate in car seat longevity and has the only side impact protection properly positioned to protect your child at each stage. 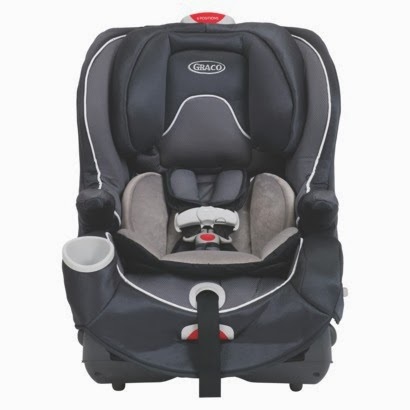 This convertible car seat fits your child from 4-100 lbs, features Safety Surround™ Side Impact Technology, and Smart Base™ a convenient stay-in-car base so you only have to install the base one time! Additional features you'll love include, seat-to-base locking indicators, 5-position recline, flip up arm rests, integrated cup holder and a 6-position adjustable headrest with no re-thread harness. Metal and plastic parts may be cleaned with mild soap and water. Turn the restraint over and push the retainer through the harness strap slot to remove the buckle from the car seat. Place the buckle in a cup of warm water upside down and gently agitate the buckle, pressing the red button several times while it is in the water. Do not submerge the harness webbing and do not use soaps or lubricants, only rinse the harness buckle with warm water. Shake out the excess water and allow the harness buckle to air dry. Reattach the harness buckle into the same slot and re-check harness for correct installation according to the car seat manual before use. Rear-facing in harness 5-40 lbs. Belt-positioning booster from 30-100 lbs. As recommended by the American Academy of Pediatrics, children 4 feet 9 inches tall or under should ride in a belt-positioning booster seat. The American Academy of Pediatricians recommends that children be rear facing until age 2 or until they reach the maximum rear facing height and weight rating for their seat and that child stays harnessed as long as possible. Buy It: You can purchase the Smart Seat™ All-in-One Car Seat with Safety Surround™ Protection here. One Winner will Receive a Smart Seat™ All-in-One Car Seat with Safety Surround™ Protection and One Winner will Receive a Blossom™ 4-in-1 Seating System! I would love to get a Little Lounger for our baby who is due in 3 weeks! We desperately need a new car seat - id love the Argos 70! If I won I would choose the Smart Seat™ All-in-One Car Seat with Safety Surround™ Protection since our car seat is expired and I need to get a new one! I also like to have from their website the Sweet Slumber™ Sound Machine. I love this seat! I also love the Graco Pack and Play! I would also love to get a Pack and Playard with Cuddle Cove Rocking Seat! i would love the Quattro Tour® Duo Classic Connect™ Stroller since i am expecting twins =0) but would oh-so-love the Smart Seat™ All-in-One Car Seat with Safety Surround™ Protection! I would also like to have their True Focus Digital Video Monitor. I would choose the Blossom 4-in-1 Seating System. I like the Day2Night Sleep System. I would like to win the Blosson 4 in 1 seating system. I love the simple snuggles bouncer and I would be stoked to win the car seat! I would love to give the Pack 'n Play® Playard with Cuddle Cove™ Premiere Rocking Seat as a gift and I would love to win the Blossom™ 4-in-1 Seating System. I would love the blossom 4-1 seating and I would love the Pack 'n Play Playard with Twins Bassinet for my niece who is due next month with twin identical girls. I would like the Smart Seat, and I would also love the Modes stroller. I would love to win the Blossom 4-in-1 Seating System, Would also love the Breaze Click Connect Stroller. I'd love to win the Smart Seat car seat, and I would also like a pack and play with newborn napper. Smart seat and I would also like the little lounger. Their bugs quilt playard is really cute. I also love the Graco Modes Click Connect Travel System in Francesca. I would love to win the car seat. As a 70-year-old great Grandpa I'm not in the market for a Smart Seat, but I do know Graco. Graco has been around for more than 70 years, and during that time has developed many of the best known baby products ever, some of which are now household terms. The Graco story started in 1942 when Russell Gray (“Gra”) and Robert Cone (“Co”) formed Graco Metal Products in Philadelphia to fabricate machine parts. Graco is still headquartered near Philly, and the Graco name is known and trusted by Mothers the world over. and I would choose the All in One Car Seat. I would love to win the car seat and would love to have a pack n play. The pack and play would be a great help around here!! I would also love to have the TableFit Highchair. If I win I would like the All-in-One car seat. I need one because my granddaughter just moved to my hometown and I don't have a car seat for her. I would love to get the UrbanLite™ Classic Connect™ Travel System and I like the Trekko Classic Connect Stroller too! Thanks so much for the fantastic giveaway! I also like their backless TurboBooster car seat. I'm entering for the Smart Seat All-in-one car seat. Please pass me over for the blossom prize. I'd love to win the blossom seating system and there Trekko® Classic Connect™ Stroller. I really like the Urban Lite Click Connect Stroller. Thank you for the super giveaway opportunity. Keep up the terrific blogging. I would also love to have the Bumper Jumper® and would love to win the All in one Car Seat. Graco is one of the two companies I trust enough to buy car seats from, wonderful company and amazing customer service. I would love to win the car seat, and I also really like the pack and play! I would love to win the car seat and I also really want to check out the new little lounger. I would love to win the high chair and am interested in their baby monitor. Digital video monitor please or a high chair! I like the tablefit highchair from Graco Baby and I would love the smart seat all in 1 car seat with safety surround protection. Love that car seat! We are wanting to get rid of our baby trend clunker of a car seat and get the SnugRide Click Connect 35 LX in Lyric for our next little one! I would like the car seat and another item I like is the jungle jumper. I would love their pack'n'plays with cuddy cove! i would choose the all in one surround car seat if i won thanks for this wonderful chance many blessings to everyone!!!! I'm hoping to win the car seat. My other favorite Graco item is the Pack 'n Play® Playard with Cuddle Cove™ Rocking Seat. I like the Valerie seat possibly. The car seat would be great! I'd like to win the car seat, and I also like the Pack 'n Play® Playard with Cuddle Cove™ Rocking Seat. I would love to win the carseat! I also love the Pack 'n Play system that Graco offers. I also love the Nautilus™ 3-in-1 Car Seat. We need a new car seat, but I wouldn't say no to a high chair! I would also like to have the Pack n Play Element Playard with Stages! The prize I want to win is the Smart Seat All in one Car seat! I like the DuoGlider and if I won I'd choose the car seat! I'd love the carseat. We need a new one! Also, the battery operated nasal aspirator would be pretty cool. I would love a pack'n'play (ingenuity) and the car seat! I'd love to have the Graco Direct Connect™ Digital Monitor with 2 Parent Units. I would prefer to win the carseat - although both are fantastic prizes! I'd be happy with the high chair OR the car seat. We could use either of them. As for what else I'd like from Graco, how about the TidalWave Click Connect stroller? I also like the SnugRide Click Connect 35. I would like to win the high chair. I like the Pack N Play On The Go Playard, and I would choose the Smart Seat. 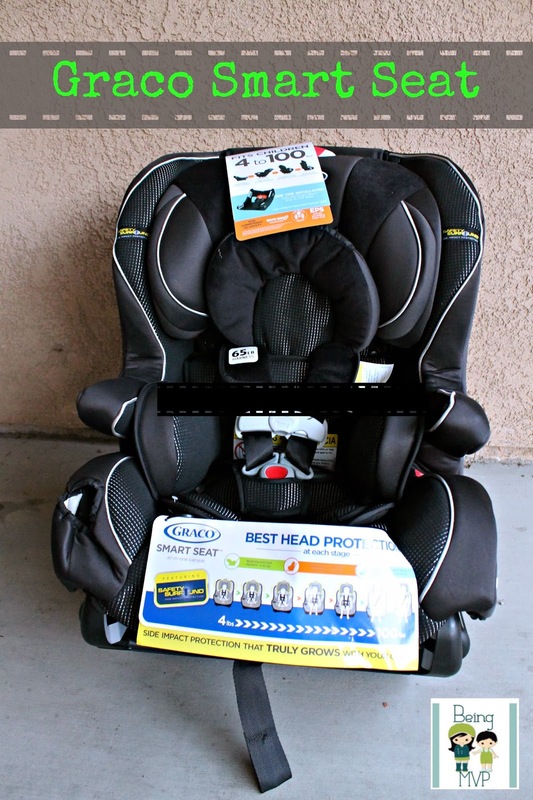 Oh I would love the Smart Seat™ All-in-One Car Seat with Safety Surround™ Protection! Carter is outgrowing his current car seat and this would be so perfect and I love that it follows them all the way up to 100 pounds! I also love their True Focus™ Digital Video Monitor! I also want the Trekko Classic Connect Stroller. I would choose the The Graco Smart Seat All-in-One car seat. I would love to win two of these all - in - one seats... I'm going to be taking in foster kids next year and these look like the perfect seats for them to keep safe! I would like to win the carseat. I also like the Pack 'n Play® Playard with Cuddle Cove™ Rocking Seat. I would like to win the Smart Seat. It is very nice. I would also like to buy their little jungle Bouncer. I would love to win the Smart Seat ! I also love their pack n plays! I want to win the smart seat, but like they pack n play as well. I'd love to have the RoomFor2™ Classic Connect™ Stand & Ride Stroller. If I won, I'd want the Smart Seat carseat.